The biggest revelation last week regarding Marawi and marital law was that the government had prior knowledge of the impending attack. 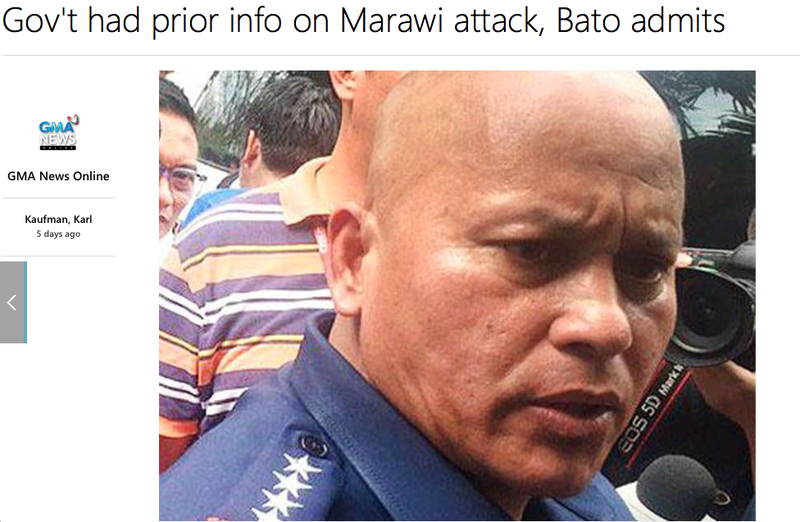 SolGen Calida made the announcement and PNP Chief Bato confirmed it. Curiously the media has been silent on this issue. The government admits they knew the attack was coming and no one wants to follow up on this? Just something else for the memory hole. We also learned last week that the USA is providing logistical support to the AFP. Is this even a good thing? 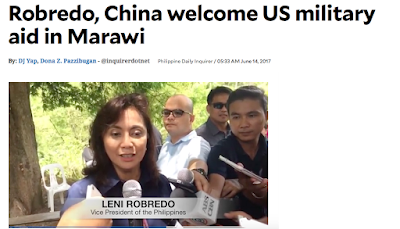 Leni Robredo and China think so. But not everyone sees US assistance as positive. 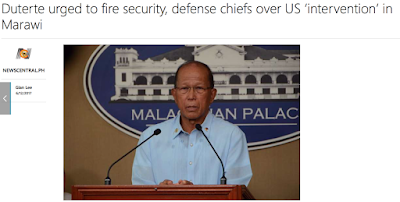 Militant partylist lawmakers urged President Rodrigo Duterte to sack Defense Secretary Delfin Lorenzana and National Security Adviser Hermogenes Esperon for allowing the Americans to intervene in the military operations in Marawi City without his approval. “This is very alarming and a shameless sellout of our sovereignty. The commander-in-chief himself does not know that his military and security officials have already asked assistance from a country that he has continually hit as a hypocrite and is only looking out for its own self-interest,” Zarate said. Does Rep. Zarate realise that the USA has been providing logistical support in Mindanao for years?? 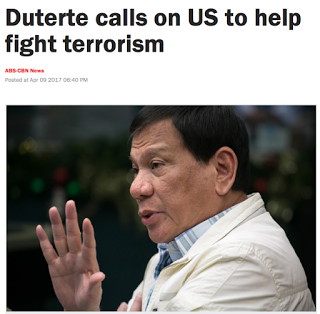 Does he not know that Duterte asked for the USA's help back in April? The Supreme Court has started hearings on the validity of martial law. We learned that the AFP told Duterte that they had the situation under control. This revelation underscores Dutrete's declaration that no one recommended martial law and that he called for it all on his own. The AFP said three times that the situation was under control. 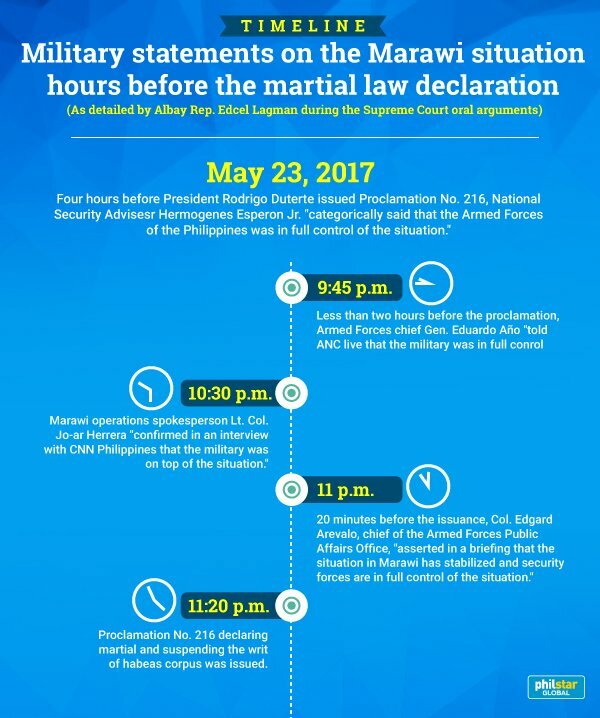 Even twenty minutes before Duterte made his proclamation the AFP said the situation had stabilised and they were fully in control. 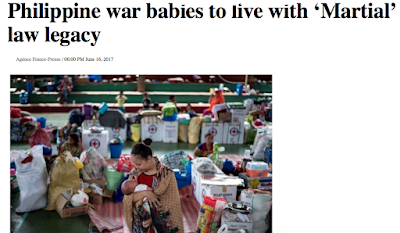 This is only more proof that Duterte used this situation as a pretext to usher in his planned dictatorship. 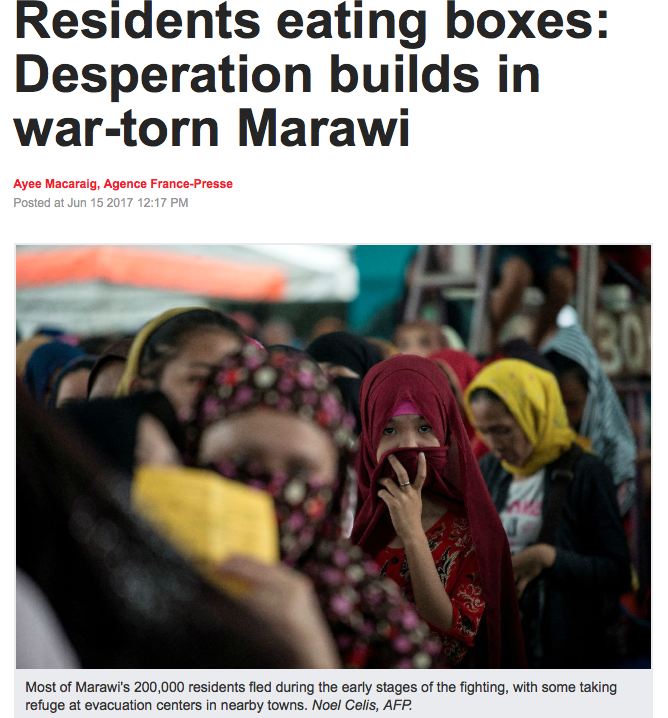 No ruling yet by the Supreme Court but Duterte has vowed to withdraw all troops from Marawi if they rule there is no factual basis for martial law. 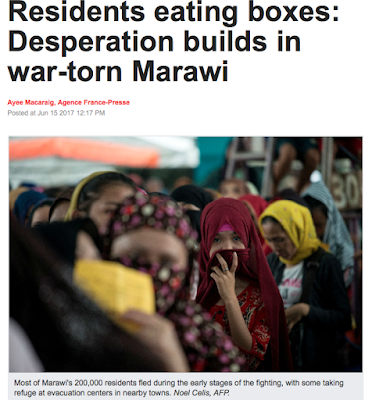 Duterte has vowed to pull out military troops in Marawi City if the Supreme Court decides that his martial law declaration in Mindanao has no factual basis. 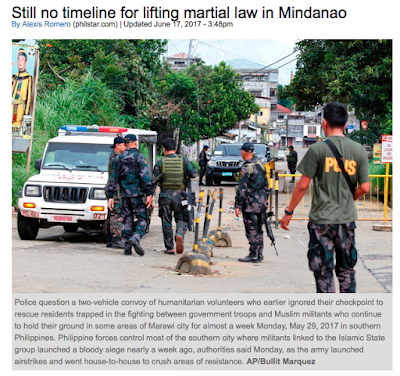 None of the petitions on martial law at the Supreme Court argue that security forces should not be deployed against the Maute local terror group that controls part of the city. The president, however, warned that he would no longer listen to anyone if Mindanao is plagued anew with violence that would require him to declare martial law for the second time. According to the president, the next martial law he would declare could be a “copycat” of that of ousted President Ferdinand Marcos, the late dictator who placed the entire country under military rule in 1972. What a great leader. 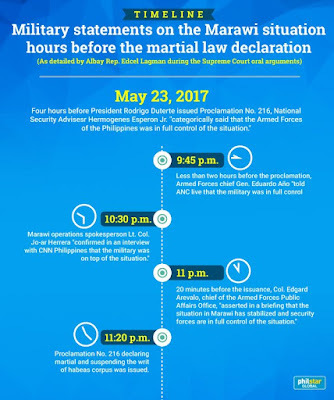 If the Supreme Court takes away his martial law then he will take away the troops and allow the area to descend into chaos just so he can declare martial law again and this time nationwide! 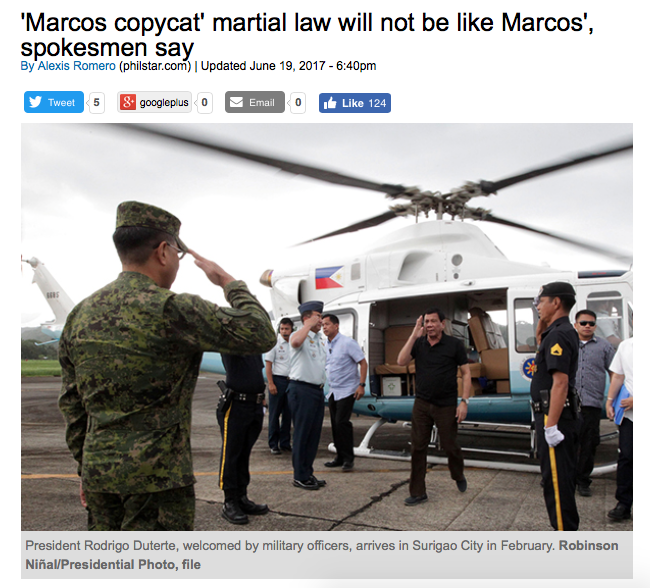 Martial law is not needed to engage in military operations. For decades the AFP has been fighting communists and terrorists both with martial law under Marcos and without after the EDSA Revolution. 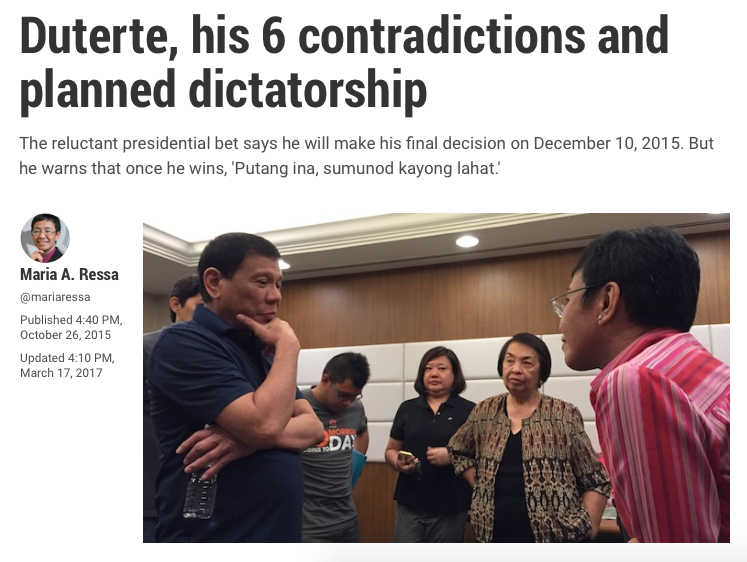 He would allow Mindanao to go up in flames just so he can have his dictatorship. And what about the people? This week we began to hear about the toll the situation is taking on ordinary civilians. Raisah Labay gently cradles her newborn, a boy who was named Martial to mark her flight from a war-torn Philippine city and his birth under newly imposed military rule. 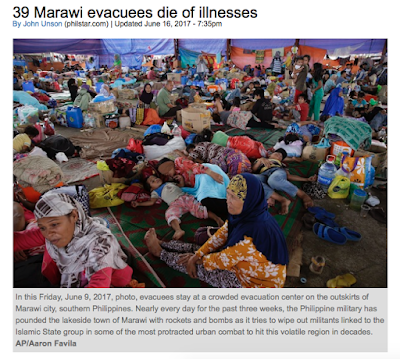 “I named him Martial as a sign that he was born in the time of war,” Labay, 21, told AFP while seated on the bleachers of an evacuation camp in a nearby city. All this horror because the government failed to act on knowledge it had of the impending attack. 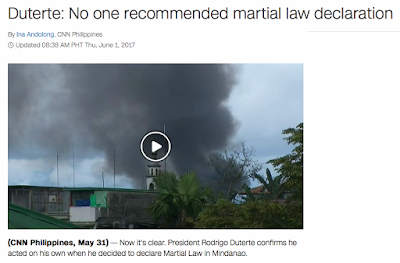 All this fear because Duterte, on his own, decided to declare martial law. And when will it end? After 60 days? No timeline? That's actually a good thing. Several times now the AFP have said the fighting is almost over. Three more days. By independence day. And now they have finally realised that they should concentrate on fighting rather than setting arbitrary deadlines. We can be confident that martial law will end when everything is safe and secure. Some people want martial law extended and for reasons that have nothing to do with terrorism. House Speaker Pantaleon Alvarez on Friday said that he was open to the idea of extending martial law in Mindanao until President Duterte steps down in 2022 to fast-track development and address the Marawi crisis and other peace and security problems in the region. 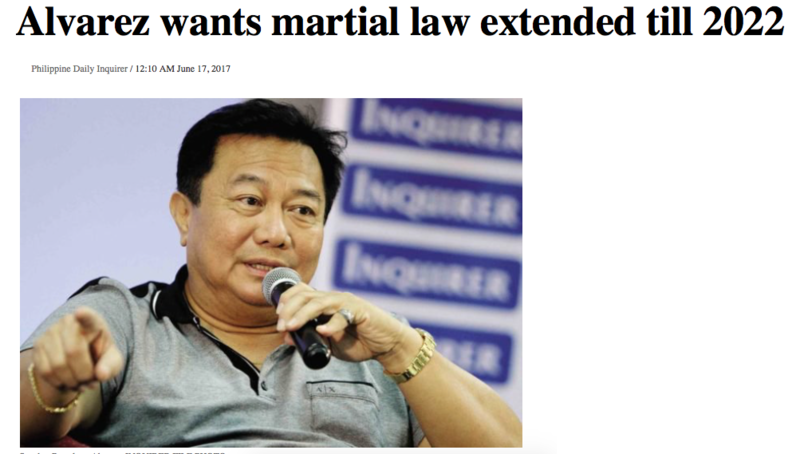 Alvarez said the nearly month-old martial rule had been well-received by majority of the more than 20 million people in the Philippine south and that critics, particularly those who were not from Mindanao, had no reason to oppose or worry about it. “I would like to extend this up to the end of the term of the President. My grounds: To really ensure the end of this conflict in Mindanao, and to fast-track the infrastructure projects. This is for our interest, isn’t it?” he said. “They have to respect the will of the Mindanaoans. If that’s what we wanted why should [people outside Mindanao] meddle? We want [this region] to develop,” Alvarez told reporters. Fast-track development and infrastructure projects?? Is martial law now to be a tool of economic development? This is Alvarez's own opinion and it is a stupid and worthless opinion. Martial law is not a tool of economic development. It is a tool to be used to quell rebellions and repel invasions. But how long will this remain only Alvarez's opinion? 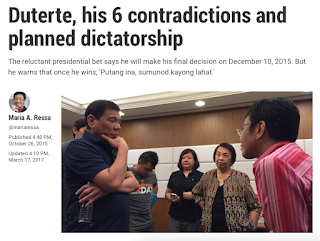 Seeing how he rammed through the Death Penalty Bill by bullying and threatening everyone to approve it, it is highly likely that he could do the same for extending martial law. With men like Alvarez leading the country it's no wonder the Philippines remains a third world nation.